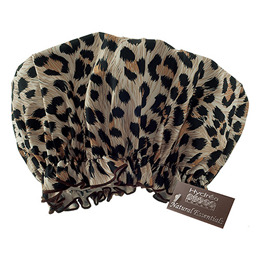 Hydrea London Eco-friendly PEVA Shower Cap with Leopard Print Design will add some glamour to your shower time. This beautifully stylish shower cap looks gorgeous but it is comfortable and functional too. The high quality cap is lined with soft, eco-friendly waterproof PEVA material, keeping your hair perfectly secure and dry in the bath or shower. Try using them during your hair treatments too - they work wonders for intensifying that conditioning! Unlike PVC, PEVA does not contain toxic phthalates, mercury or chlorine. PEVA is also biodegradable and recyclable as well as strong, waterproof and flexible. PEVA is much better all round for the environment and for human health. Place over the top of your head when in the bath or shower to keep your hair dry. Try using them during your hair treatments too they work wonders for intensifying that conditioning. Below are reviews of Eco-friendly PEVA Shower Cap - Leopard Print Design by bodykind customers. If you have tried this product we'd love to hear what you think so please leave a review.